What if leaving your loveless marriage is not an option; would you cheat? Red, that was his name. He was big and beautiful and even though we were from different worlds, we fell madly in love with each other. When he was sent to prison, he left me pregnant and devastated. But now he’s back, angry, accusing, and wanting his child, prepared to destroy my marriage and anyone in his way. I’ve moved on. I’m married with a husband who loves me, and my son knows nothing of Red. How do I handle Red’s demands, his fury, his bitterness? How do I manage the beautiful memories that flood me every time I look at him? How do I manage my longing for Red and stay faithful to my loveless marriage? 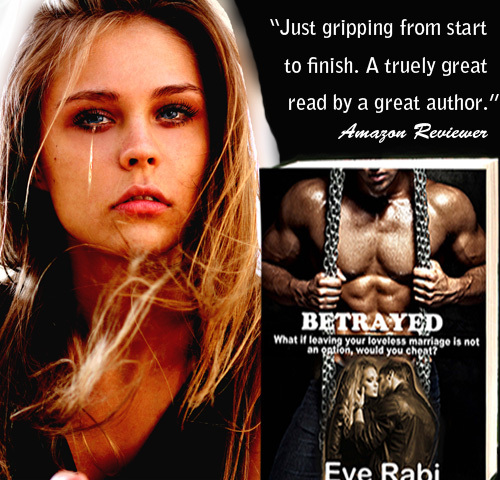 BETRAYED by Eve Rabi is a modern-day, romantic thriller that will make you laugh, make you cry and keep you in suspense throughout your read. Most of all, this contemporary romance, with its steamy love scenes and drama-filled pages will keep you riveted and on the edge of your seat.